Goree is a strategically important island just off the coast of Dakar, Senegal. Being off the coast, it was an ideal and relatively safe staging post for the early European traders feeling their way down the African coast. It was not long before Portugese, Dutch and the French realised the value of the island in helping them to coordinate the slave trade from West Africa to the Americas. The island shifted possession frequently as the Europeans fought over this highly profitable trade. The Portugese had occupied the island since 1444, but the Dutch replaced them a century later. In fact the name of the island is a corrupted spelling of the Dutch 'Goeree'. The Dutch and English fought frequently during the Seventeenth Century and it was as the result of one of these wars that the English first took occupation of the island in 1663. The Dutch soon recaptured the isle only for them to have to hand it over to the French. The British returned from 1692 to 1693. It was generally due to the Anglo-French rivalry that the island was frequently occupied and relinquished over the next century and a half. The rising power of the Royal Navy vis-a-vis the French navy meant that isolated islands like Goree were easy picking for the British. 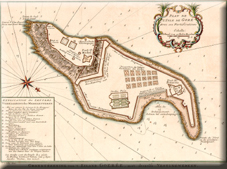 They took charge of the island in 1758 as a result of the Seven Years War. They took it again in 1779 thanks to the American Revolutionary Wars and then again from 1800 to 1817 thanks to the Napoleonic Wars. The island then reverted to the French for good, although there was yet one more reason for the British to raid the island. In 1940 some of the French fleet was in port in nearby Dakar. Senegal's governor declared allegiance to the Vichy government. Therefore the Royal Navy and Free French Forces bombarded the Governor's residence on the island whilst they attempted an aborted landing north of Dakar and sank as much of the Vichy fleet as it could. A video on the role of Goree in the slave trade.